Unity Candle Holder (Holds 1 pillar and 2 tapers). CANDLES NOT INCLUDED. Literary caption on base: Let Love Light the Way. 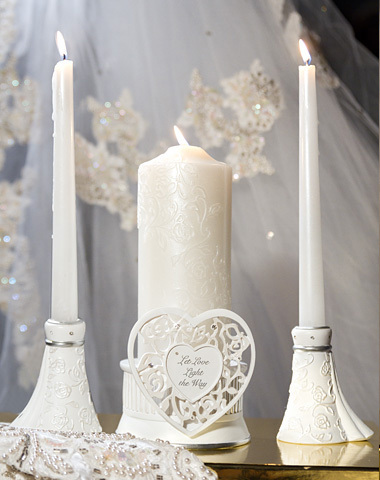 This stunning 3-piece candle holder set features a pierced filigree heart with accented rhinestones mixing traditional style with modern elegance. The center heart is engraved "Let Love Light the Way." The taper candle holders have a rose design with silver accents. Candles are not included - the set fits (2) standard taper candles and (1) 3" or 3-1/2" column candle.